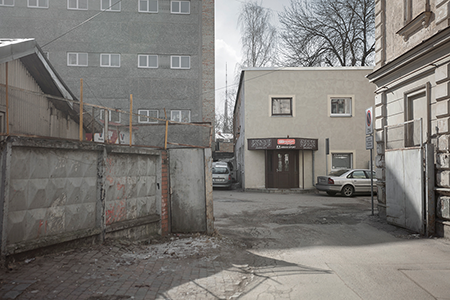 Almost all ex-Soviet cities have a story like this. What started as little more than a hole in the wall for street kids to pump up their muscles in the crazy nineties gradually grows into a combined business holding, political party and private army. Such incubators of physical as well as political power also exist in Latvia, although these are more glamorous and law-abiding versions of their equivalents to the east. 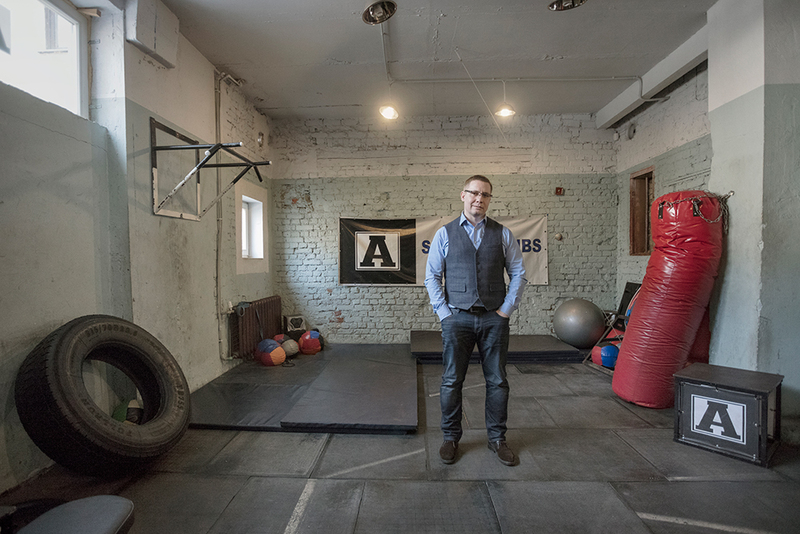 A modest gym in a poor and drug-ridden district called Maskačka (Moscow suburb), created in 2003 by former Latvian army serviceman Vitaly Dubov, has grown into a network of public organisations and commercial enterprises closely connected to Riga’s municipal government. Dubov and his athletic-looking friends first shot to fame by battling drug dealers in Maskačka, and then established control over Riga’s central market. Next came handsomely paid posts in enterprises controlled by the municipality and election to both the city council and the Latvian parliament. Since then, the city of Riga allocates many thousands of euros for their projects, but Dubov doesn’t see that as a conflict of interest. Dubov dubs himself a Maskačka patriot. He moved to the suburb from a small village near Riga when he was seven and his mother, a worker at a textile factory, was given a flat by the Soviet state. His family is ethnically mixed, with some relatives speaking Russian and others Latvian. His father hails from Latgale, one of the poorest regions in the European Union (EU) bordering Russia and Belarus. He was a railway worker. His mother moved to Latvia from Belarus during the Soviet era and has the passport of a non-citizen. During his school years Dubov played rugby, but after the USSR collapsed many state-sponsored sport clubs like his were shut down. Maskačka teenagers poured into the streets, where they became easy prey for criminals who lured them into gangs. It was Dubov’s father who dreamed about his son choosing a military career. 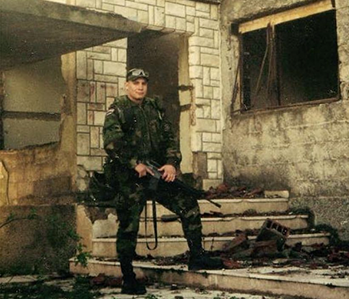 Dubov joined an airborne commando unit. While his knowledge of Latvian was initially minimal, it wasn’t a problem. “In the army, everyone understands that we are covering each other’s backs, no matter which language you speak. Your ethnicity is ‘soldier,’” Dubov says. Today he speaks Latvian fluently. Captain Dzintars Roga, who declined to be interviewed for this story, played a key role in determining Dubov’s fate. He offered the young soldier a post in a peacekeeping unit heading for the Balkans. After commando school in Denmark, he was deployed to Bosnia as a part of SFOR, a peacekeeping force operating under a United Nations mandate. In 2001, Corporal Dubov resigned from the army for family reasons — his wife complained that they barely saw each other because of his military service. Dubov founded a sports club, initially called Extreme Sport, but subsequently renamed Arkan, a term Cossacks use for “lasso”. Considering his experience in the Balkans, this inevitably draws associations with the most infamous Bosnian and Kosovo war characters, the late Serbian war criminal Željko Raznjatovič aka Arkan. He was assassinated in 2001 and became a hero for both Serbian and Russian nationalists. Dubov denies any connection and says that he has only recently read about Arkan on Wikipedia. “It’s all very murky,” he says of Raznjatovič’s life story. According to Dubov, the name emerged after the club was forced to move from its original premises to the current location, which is owned by an Old Believers church community. 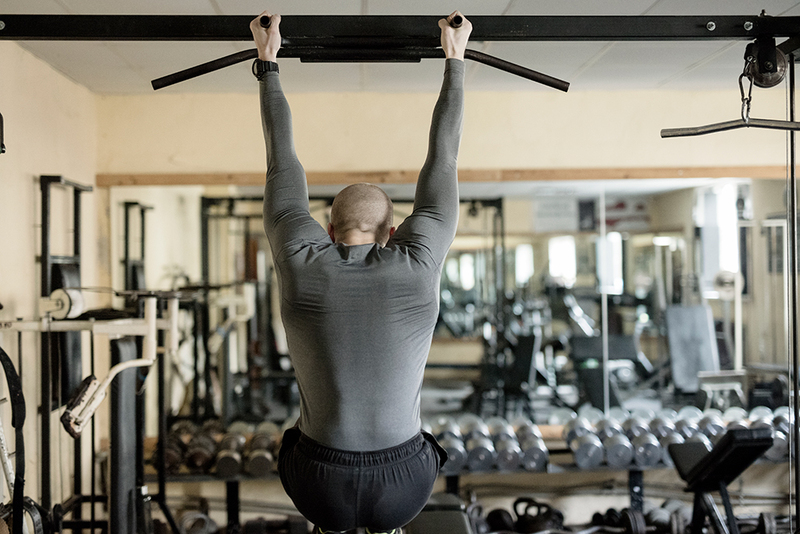 The Old Believers demanded that he pay rent strictly on time, so Dubov and his colleagues began scouring Maskačka to lure streetwise teenagers into the gym. Between themselves, they called the process “arkaning” (заарканить in Russian), hence the name. 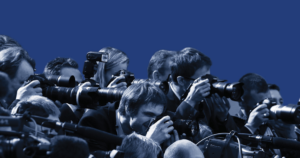 Among those caught by Dubov’s lasso are his current friends and political allies, Andris Morozov and Valery Petrov. 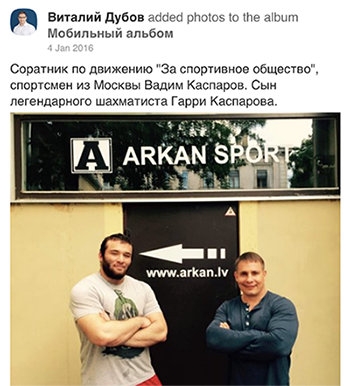 Petrov, a boxer, visited Arkan to stay fit. Morozov “all but lived in the club” after moving to Riga from Latgale, according to Dubov. He says the drug situation in Maskačka was about as bad as in Yekaterinburg. When the epidemics of “spices” (cannabinoids that were legal in Latvia until 2014) engulfed the district, “Maskačka athletes” – Dubov’s term for his entourage – started shutting down drug markets, using methods inspired by Royzman. Dubov’s Arkan friends were there to help. 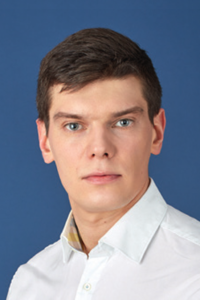 Petrov, who was building a career in Riga municipality, secured support from mayor’s office. 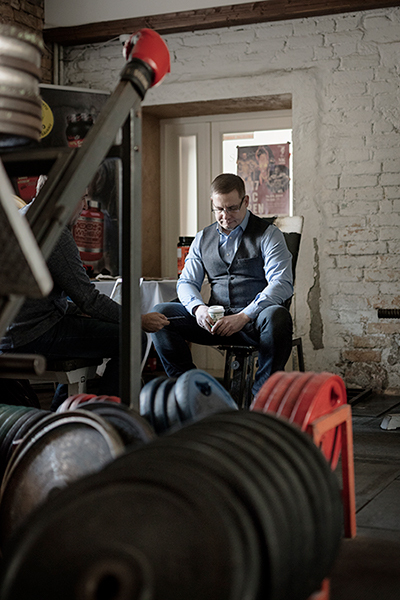 Morozov helped to gather intel on the de-facto owners of drug-selling locations in Riga’s business community. They emerged as a political trio, with each member specialising in specific tasks. Dubov worked on projects related to sport, the army and private security; Petrov served as a guide in the corridors of power; and Morozov was in charge of joint business projects. Of the three, Morozov is the most experienced in business operations as they relate to politics. He built a career in businesses linked to Russian politicians and later to the Harmony party. 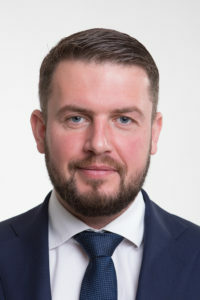 Beginning in 2010, he headed the Latvian affiliate of the Russian company Teko-Terminal, which facilitated customs checks on the Russian side of the Latvian border. The company belongs to Oleg Bryachak, a deputy in Pskov’s regional council who also headed the regional chapter of the moderately pro-Kremlin party Just Russia. He is also the son of Mikhail Bryachak, a deputy in the Russian State Duma, who worked on the parliament’s committee on transport. In the Pskov region, the Bryachaks were arch-enemies of former governor Andrey Turchak, who became the formal head of Russia’s ruling United Russia party last September. Their political conflict stemmed from a struggle over control of customs on the Latvian border, Russia’s import and export gateway to the EU. Oleg Bryachak lost the war and his company went bust in 2015. But by that time, Morozov was already focused on Latvian politics and related business projects. Petrov was first elected to the city council in 2009. At that time he was officially unemployed, with a debt of €15,000 and savings of €30,000 – in cash, according to his tax declaration, which doesn’t explain the sources of his earnings. The election visibly improved his fortunes. 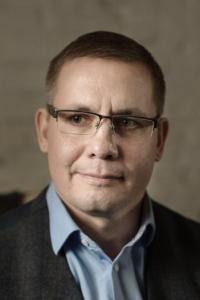 After getting paid jobs at the municipal enterprises Ceļu pārvalde and Rīgas Namu Pārvaldnieks, Petrov now receives €4,000 per month and spends considerable amounts on funding his own political movement. 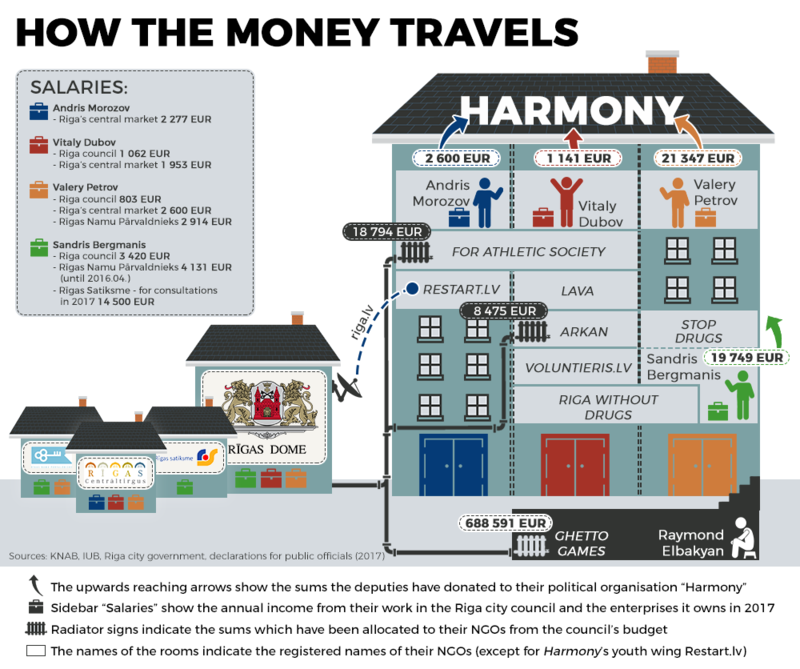 Since 2009, he transferred around €20,000 to parties that formed Harmony. According to Dubov, it was Petrov who introduced him to Riga’s Mayor Nils Ušakovs. In April 2013, Dubov and Petrov founded the public organisation Riga without drugs, copying the name of its Yekaterinburg equivalent. In November of the same year, Mayor Ušakovs held the first meeting with the anti-drug campaigners. Besides Dubov, Petrov and Morozov, it was attended by Raymond Elbakyan, the organiser of a large annual sport event, the Ghetto Games. From 2015-2017, NGOs linked to Elbakyan received €700,000 from the Riga council, while Elbakyan produced a film for Ušakov’s election campaign. Among others at the meeting was Saulus Šeykis, the future fighter for “traditional values,” and another Latvian army veteran, Sandris Bergmanis. Today Bergmanis is Dubov’s colleague on the city council. Like Dubov, Bergmanis built his political career as a drug buster and proceeded to occupy three successive positions in municipal structures and enterprises controlled by Riga’s council. Drug dealers in Maskačka were soon defeated, but Dubov and his friends remained hyperactive. On July 3, 2013, Dubov and Morozov founded an organization called For Athletic Society, which united several martial arts clubs, as well as Elbakyan’s Ghetto Games and tanec.lv led by Avvakum Petrov (no relation to Valery Petrov). Among founding members of the society was Vadim Kasparov, the Riga-based son of the Russian chess champion and opposition politician, Garry Kasparov. 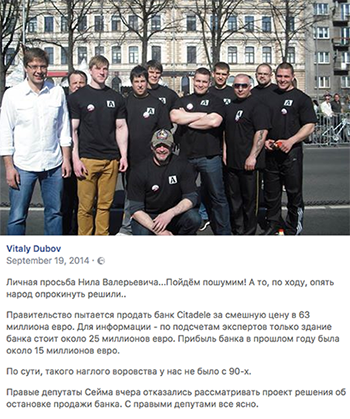 One week later, Dubov founded LAVA, an association of Latvian army veterans. In his posts on Odnoklassniki, the Russian social network, Dubov calls Andris Morozov a co-founder of the organization, even though Morozov has no relation to the army. 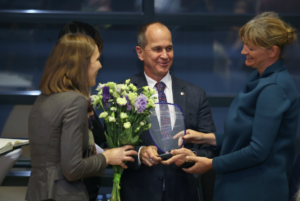 But speaking to Re:Baltica he said that Morozov was only offering organisational support, while there was another co-founder, whom he refused to name. Dubov is the only person featuring in LAVA’s founding documents. By the end of 2013, LAVA held a Christmas event attended by Defence Minister Artis Pabriks. The organization was taking care of veterans’ combat readiness, organising strike ball competitions and trips to Latvian military bases for “Maskačka athletes”. During one such trip in March 2014 (the month when Russia occupied Crimea) Dubov posted a joke on Odnoklassniki. He wrote that “athletes from the Moscow suburb have joined Riga’s self-defence unit and moved on to the decisive phase in the fight against legal drugs.” That post was accompanied with photos showing the athletes wielding machine guns. Public initiatives went hand in hand with business projects. In the same year, Dubov announced on Odnoklassniki that “athletes from Arkan Sport now work in the sphere of private security.” He named For Athletic Society and LAVA as partners in this business. Also in 2014, the list of public organisations run by Maskačka athletes was enlarged with the addition of a charity organisation – Voluntieris.lv. All organisations created by Dubov and his friends gravitated towards Harmony, the party of Riga mayor Ušakovs. In July 2014, Dubov was promoting Morozov as a candidate in Latvia’s parliamentary elections. “We are delegating him to the Latvian Saeima as a representative of public organisations, as an athlete from Maskačka,” he wrote on Odnoklassniki. In March 2014, Maskačka athletes, rallied by Voluntieris.lv, participated in a street event titled “Latvia – my motherland” and organised by Ušakovs. The event promoted inter-ethnic harmony against the backdrop of the military conflict starting in Ukraine. In September of the same year, Ušakovs invited Dubov, Morozov and Bergmanis to a Harmony-led rally against the sale of Parex bank to American buyers. Dubov and Morozov were responsible for security at the event, while the crowd seemed largely comprised of athletes from Maskačka. In June 2016, Morozov became the director of Riga’s Central Market, a municipal enterprise controlled by Riga’s city council. Morozov appointed Dubov as head of security at this sprawling complex. Dubov describes himself as a man of “Western mentality” and says that he “only visited Russia a couple of times in his life” and has no links with the country. But his own statements and those of his allies indicate otherwise. 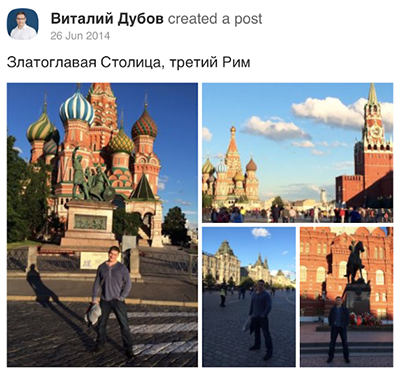 In June 2014, he posted a photograph of himself in front of St. Basil’s Cathedral in Moscow’s Red Square. It was a significant time to be visiting Russia: the third month of the military conflict in Ukraine, and the Kremlin was organizing trainings for Russian-speaking activists from neighbouring countries, including Latvia, at the Russian Humanitarian University in Moscow. Dubov denies he was in Russia because of these. He says he was visiting Moscow with friends and drove by a famous Orthodox monastery in the Pskov region on the way back. In any case, Dubov and his friends went on to fight for “traditional values” and against “gay propaganda” – an illiberal agenda set by the Kremlin to fight against “white ribbon” liberal opposition inside Russia. Russian influence on Maskačka athletes is most visible on social networks, where they have been actively promoting homophobic narratives of Russian origin. In February 2015, Latvian citizen Rodion Kušnir, who fought on the side of pro-Russian rebels in Ukraine, was killed in the battle for Donetsk airport. While still in Latvia, he left a “like” on Arkan’s Facebook page and a comment mentioning Arkan under a post about a sport event attended by members of the club and the mayor of Riga.